John Gregory Murray was born in Waterbury, Connecticut in 1877. In 1900 he was ordained a priest for the Diocese of Hartford, Connecticut, and in 1919 was consecrated auxiliary bishop for the diocese. In 1925 he was appointed bishop of Portland, Maine. 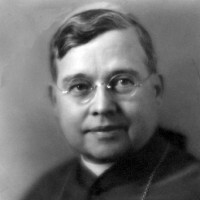 He was appointed as the third Archbishop of the Archdiocese of Saint Paul on October 29, 1931. Archbishop Murray was regarded as a generous and approachable bishop, who had a great love for the people of Saint Paul and Minneapolis. During the depression, Pope Pius XI wrote an encyclical (Caritas Dei) highlighting the importance of charitable works to those in need. In response, Archbishop Murray began a crusade of charity to support the poor and unemployed, He showed his solidarity, moreover, by taking public transit or walking in the downtown areas and forming many lay groups to take action against poverty. Known for his academic excellence and defense of the faith, he began a radio show on WCCO called “Church of the Air”, established the Confraternity of Christian Doctrine, the Family Guild, and mandated liturgical reform in the Archdiocese. When the National Eucharistic Congress came to the Twin Cities in 1941, many saw it as a testament to Archbishop Murray’s zeal for the faith. The hard times of the depression and World War II were trying on the Archbishop, yet he provided a stability that the changing times had shattered. During his tenure, he established over 50 new parishes, eliminated debt at the College of Saint Thomas, meanwhile building a science hall, gymnasium, and a new seminary library. Archbishop Murray died of cancer on October 11, 1956, and is interred at Resurrection cemetery.